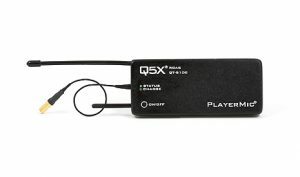 The QT-5100 RefMic incorporates a non-popping, audio mute switch. This enables the wearer to mute and unmute the audio without causing any audible popping. This transmitter is ideal for Referees, Umpires and a variety of officials who only need audio for brief announcements. This is also a good solution for corporate presenters who need a top quality audio experience that they can control. 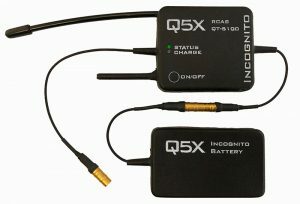 The QT-5100 RefMic utilizes RCAS™ (Remote Control Audio System) a revolutionary way to remotely control transmitter settings from a central computer or hand held remote control. The remote functions allow technicians to control; on/off, monitor status and battery level and make on-the-fly adjustments of frequency, mic gain, RF power level, mode and grouping, all wirelessly. The QT-5100 RefMic offers approximately 3,000 channels. It is remotely tunable from 525 to 600 MHz in 25 kHz steps. The QT-5100 RefMic has a tough, composite hard case with belt clip. This transmitter is the RCAS™ enabled version of our worlds smallest belt pack, the QT-300 BeltMic. 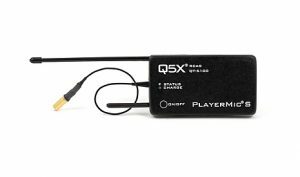 Weighing less than 2 ounces and only a 1/2 of an inch thick, the QT-5100 RefMic joins the QT family as the most comfortable audio transmitters in the industry.